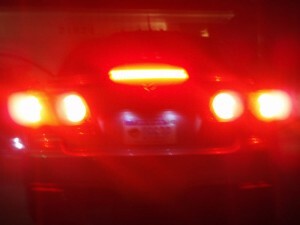 When driving on the freeway in heavy traffic and something happens ahead of your car, the tail lights of cars far up the freeway light up, warning you of problems down the road. It can look like the lights on an airplane landing strip, each red light sequencing its turn to glow immediately after the next one in front, so that fifty lights covering a mile can rush toward your car in just seconds. It can be an immediate warning system, if one chooses to see it. Flashing brake lights that far in advance of a problem, can save your life, unless you are so preoccupied by “other stuff” you don’t heed the warning. Unless you are too busy to see the warning signs; then a big crash may be in your near future. Just like a speeding car on a freeway whose potential for a mishap is great, so it is with our lives, even though most of us rarely crash, we are constantly in a position to misread the warning signs, resulting in a multi person calamity. We need to get better at reading the tail lights in front of us. The warning label on a pack of cigarettes is a glowing tail light warning you of approaching danger. An expanding waistline, combined with a high fat, low vegetable diet is a brake light in your future. Ongoing flirtations with the single (lonely) girl (guy) in your office is a massive pileup waiting to happen. It’s 7:00 pm and you are finishing your third cocktail; can you see the lights? You worked 60 hours this week and will do the same next week; your children can see the tail lights even if you can’t. We have learned to avoid accidents while driving by paying attention to our surroundings, by learning to anticipate problems and then positioning ourselves to stay out of trouble. Sometimes we get hit from nowhere, but usually we can see the danger coming, unless we aren’t paying attention. That’s the key, isn’t it? We have to pay attention to the warning lights in our life and then move so we don’t end up in a crash. The brake lights are there; we just have look, and not get distracted by “other stuff.” Keep your eyes on the road. This entry was posted in Living a Christian Life, Where Are You Going Today and tagged brake, God, important, Jesus, lights, warning, Wisdom by Michael Obermire. Bookmark the permalink.